This is an unusual and very difficult to find McCoy item – a wine bottle! It measures 10 ½” tall and bottom is marked McCoy (with lines), USA. 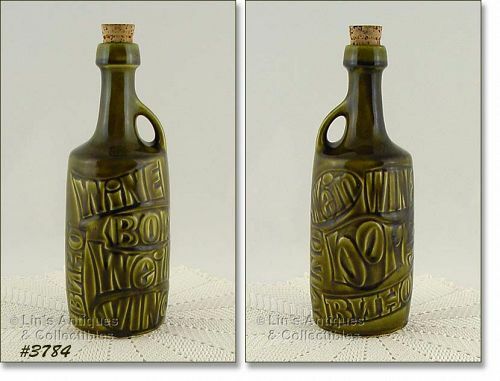 Bottle is a pretty dark green color and is in excellent condition. This listing has an excellent condition and difficult to find McCoy wine decanter! Produced in 1073, this is called the Wine Cellar Decanter. It measures 8 1/4" tall to rim, bottom is marked USA, and it's white with lots of little brown "speckles". 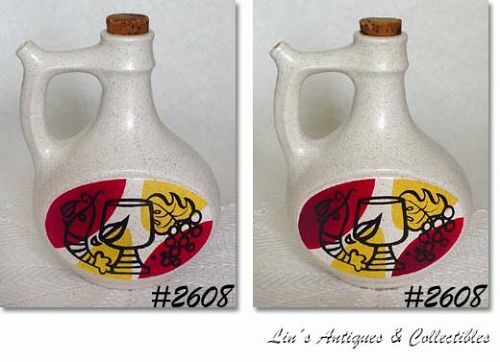 The decorative decal on front of decanter is colorful and unmarred. I have 2 of these decanters available in this listing -- both are in excellent condition! NEAT ITEM! THIS IS THE "JUPITER 60" STEAM ENGINE DECANTER MADE IN 1969 BY MCCOY FOR THE MCCORMICK DISTILLING COMPANY. 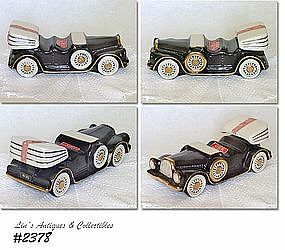 NICE SIZE -- MEASURES 13" LONG, 6 1/2" TALL (AT TALLEST). IT HAS SOME MISSING PAINT FLECKS -- NOTHING MAJOR OR SERIOUS AND COULD BE EASILY COLOR TOUCHED UP IF YOU CHOOSE. THIS IS A GREAT ADDITION TO A COLLECTION. 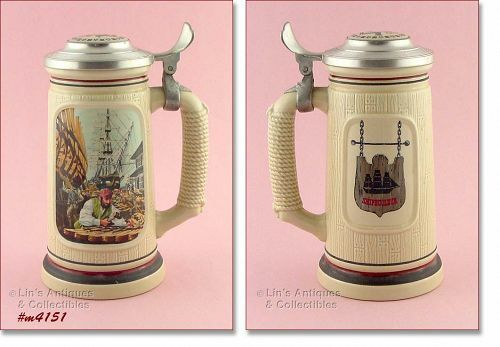 This listing has a beautiful commemorative decanter made by Royal Halburton China! 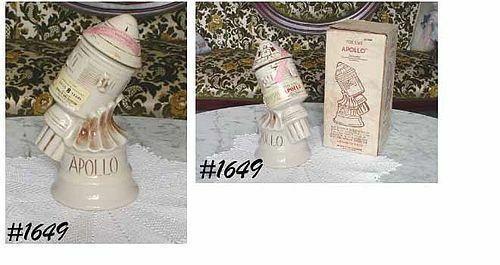 McCOY POTTERY -- SIMS DISTILLERY APOLLO DECANTER IN ORIGINAL BOX! VERY NICE COLLECTOR'S ITEM! 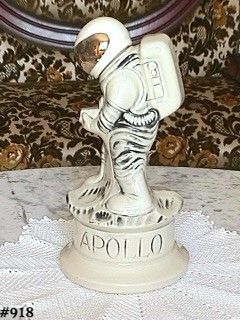 THIS IS THE APOLLO DECANTER MADE BY MCCOY FOR THOMAS W. SIMS DISTILLERY OF STANLEY, KENTUCKY. 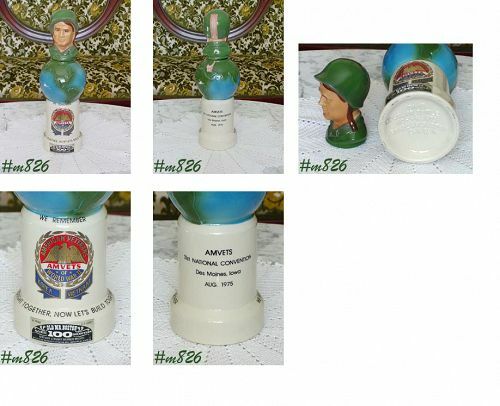 This is the difficult to find Apollo astronaut decanter made by McCoy for Sims distillery! It is marked on bottom: Copyright 1970 by Thomas W. Sims Distillery, Stanley, Kentucky, 203. Marked in center of bottom: USA, Dec. 1968, July 1969. Very Retro! This listing has a set of 8 Hi-Jacks -- terry cloth covers that go on your glass or can and function as coasters. 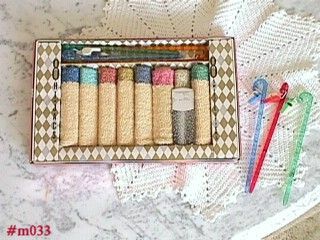 This set has 8 plastic swizzle sticks with assorted whistles attached -- when your host or hostess doesn't bring refills quickly enough! Still in the original box, never used!